Let us continue in this study by considering what the Scriptures reveal regarding this ministry and gift of exhortation, as inspired and directed by the Holy Spirit. Here we see brethren, that exhortation, strictly speaking, is not the same as teaching, although it is an earnest pleading for those being exhorted to walk according to the manner laid down previously in the teaching; to enter in and possess the fullness of that promised in the teaching in other words. There is always a need it seems, while we are in the flesh and the world, to be exhorted to continually and actively appropriate the blessings and promises of God by faith, as expressed by His Word (both the Living Word and the Scriptures which contain that Living Word). In verse 2 above, we see that the Apostle Paul had earlier given the injunctions related to how they should walk in this newness of life. And here he was merely exhorting them to continue walking in them, to live the life, to press onward into the very fullness and holiness of the Lord Jesus Christ. For the Christian faith, this is nothing less than a living walk originating in, and empowered by the Living Word that came down from heaven. It is not enough to merely receive some teaching about what this life means or represents, but we are urged to actually enter into this life, to apprehend (through teaching) and appropriate it (by faith) in all of its fullness and reality. Because we so readily seem to forget this essential fact, and allow our testimony to become little more than hollow religious experience, the Holy Spirit is constantly reminding us of what “newness of life” actually means; that it is an existence apprehended and appropriated by faithful obedience to every word breathed by God. This, when all else is said and done, is the aim of all spirit-breathed exhortation – to appeal to, and encourage believers to appropriate all that the Lord Jesus Christ has wrought for them, and promised in His Word. It is, therefore, not a gift for the faint of heart, or those who so readily shun controversy or opposition. For with such a gift, comes also a God-given courage and boldness to direct His truth and light to wherever He chooses. Notice, for example, how frequently in his epistles Paul is urging and beseeching, exhorting and encouraging his readers to do more, to go further, to run faster, to grip tighter, to labor more intently, to focus more narrowly on what it is out ahead, to be careful, to exercise wisdom, to be adequately equipped, to fight the good fight of faith, to move on towards maturity (and the list goes on). Again, there is an obvious correlation between teaching on the one hand, and exhortation on the other. They are often mentioned together in Scripture, and it would be a rare teacher indeed who would never exhort his students to apply that being taught. And yet in Romans 12:8, we see the gift of exhortation identified as a distinct function of the body, quite apart from that of teaching. This being so, it is well worth our time to dig deeper to comprehend how the gift of exhortation is to be expressed and directed by the Holy Spirit. Notice in the verse mentioned above that Paul is exhorting the brethren in Thessalonica “through our Lord Jesus Christ“. The very basis of his appeal is through, or by the authority of, the Master. Now to exhort through the Lord Jesus Christ suggests that the exhortation (whatever it happens to be) flows from the Master Himself, and His intuitive understanding of the condition of the Body. It is (and must only be) His perfect perspective from which the exhortation to change, or continue, or to do anything must come. And so if any of His servants are to exercise the gift of exhortation for the edification of the Body in the sense laid down in Scripture, then it can never be derived from their own opinion or judgment of what is needed. What we see simply doesn’t matter, and in another sense, we are not even permitted to judge another man’s servant (Rom 14:4). Only He who searches the heart can know the true condition of any individual or company of believers at any moment in time. Those exercising the spiritual gift of exhortation are to do so with “all longsuffering and teaching” (or patience and instruction). The sense here is that exhorting the brethren into the deeper things of Christ is not a ‘one time, fix all‘ proposition, but a continuing calling, requiring patient devotion and love toward those being exhorted, especially as we draw nearer to His coming for His own. A helpful illustration might be that of a devoted and loving parent training children. Any parent knows that it is not enough to merely teach your child something important once and for all; but there is a perpetual need to patiently exhort them in the required behavior or pattern. Patience, therefore is not an option for the fruitful exhorter of the brethren. Note the depth of such patience and longsuffering in the Apostle Paul, throughout all of his letters to the saints as an example. And lest we think this is a quality or disposition found naturally in the human heart, it is most definitely not. Galations 5 reminds us that patience and longsuffering are fruit of the Holy Spirit, just as exhortation is a gift of the same Spirit. We also observe above that the imperative for spiritual exhortation flows out of the times and seasons, as lying in the foreknowledge of our Lord and Master. Indeed, the great falling away, or apostasy of the last days, as revealed in the Scriptures, may well be upon us brethren, and yet there will always be a remnant who hunger and thirst for the authentic life of God and His righteousness, regardless of the many who have chosen the broad way that leads to emptiness and rejection at His Coming. There must also be a willingness, on the part of exhorters, to “endure hardship” in the exercise of their gift. Now there will always be those in the church, perhaps the many, who will not suffer to be exhorted to change their ways, or forsake the path of men for the path of God. For them the deeper things of Christ, and the fullness of His Life mean little, for to them church is about affirming all that they are already, and for tickling their ears with sugary reinforcement. To them (like the official teachers and religious leaders of Jesus’ day), he who exhorts is most decidedly unwelcome, and to be silenced at all costs. This is why, brethren, our churches are too often filled with syrupy, man-affirming believers, who are blind and ignorant of the faith once delivered. This is also the reason the word of exhortation has, for the most part, moved beyond the walls, and the days before our Lord’s Appearing are short. Dear saints, the testimony of Simeon and Anna recorded for us in Luke 2 is profoundly meaningful on so many levels, and I wanted to share some thoughts on this matter as the Lord permits. Now there are many heaven-sent truths to be derived from this account, surrounding the character and circumstances of Simeon and Anna for example, but it appears evident that these two individuals were of only a few who were actively anticipating and seeking the arrival of the Anointed One; the King and Savior of Israel. Where were all the Scribes one wonders, or the Pharisees and Sadducees whose ‘extensive’ understanding of the scriptures had equipped them to be teachers and guides among the people? The time of the Messiah’s blessed and longed-for arrival was imminent, and yet the majority of Jews were either unaware, unprepared or otherwise distracted by other matters; perhaps the politics of the day, the demands of daily life, the immediate needs of family, or other seemingly ordinary human pursuits and interests? How could this have happened? Why were not the pastors and teachers in Israel, to whom the people were so overly dependent for their spiritual vitality, adequately preparing them for the coming of the Lord? Where was the prophetic urgency? In contrast we have two insignificant ones, devout and elderly saints led entirely and personally by the Holy Spirit, moved by the urgency of the prophetic moment, “preaching in season and out of season” in the temple, patiently loving the appearing of their Messiah. Though all of the notable elders, teachers and established sects of the day had completely and utterly missed the most important event in the history of the world, a forgotten old man and a lonely old widow were there. This makes you wonder doesn’t it my brethren? Oh how His ways are so much higher and deeper than ours. Both were prophets in the purest sense of the word. And they knew fully the prophetic scriptures indicating the imminence of the time in which they were living. Both were empowered and directed by the Spirit to make themselves, and any others who might listen, ready for that day of visitation. For both of them, this was the singular obsession of their lives; nothing came before it in terms of their time, attention or devotion. Theirs was a faith perfected unto endurance by time and testing (James 1:3). With unflinching steadfastness and determination they pressed on , day after day, waiting, hoping, pining for the fulfillment of all that the Word and Spirit had conveyed to them. Rest assured dear saints, that the coming of the Anointed One was no peripheral doctrine or teaching, as it was in the synagogues of their day or the churches of ours. It moved them to watch, to act, to make themselves ready, to purify themselves, and to exhort others in Israel to do the same. 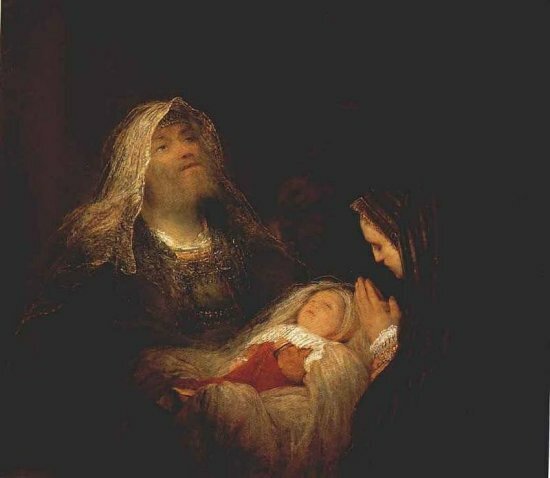 For Simeon (his name means “hearing, or to be heard” in Hebrew), only the vision of the Lord’s Christ stood before him and his own mortality, for the Spirit had revealed to him that he would indeed behold the Anointed One before his death. The suggestion here is, I believe, that he must have died shortly after this incident. Imagine if you will, this elderly saint taking the little child in his worn and wrinkled hands, and the indescribable joy that must have washed over his entire being in that intense moment. He knew precisely who the little child was. His faith had been rewarded. The Word had been fulfilled. The singular purpose of his life had been realized in that single moment of time. Unlike Anna, we know very little about Simeon’s lineage or personal history. All we know essentially is his name, which he shares with one of the children of Jacob. It may be instructive to highlight here the rather inauspicious history of Simeon, as he received no blessing whatsoever when Moses blessed the tribes, and became a scattered and divided people upon entering the land. What we might gather therefore, is that the name Simeon in Israel came to be regarded in a derogatory manner. And yet here we have this aged saint being blessed by the grace of God at the arrival of the Comforter of Israel. And next we learn of Anna (meaning “grace, or favor” in Hebrew), who over the course of a long and (presumably in the worldly sense) lonely life, fasted and prayed, and spoke out in the temple to all who would hear for many decades (84 years, which is the product of 7 and 12, two numbers rich in scriptural meaning). Anna, it appears, was not at all caught up in the hopes and affairs of life in the world, or the pursuits or distractions of the day. Hers was not the sterile religion of the people, for she looked only to God and His salvation, as she was moved and enlivened by His Holy Spirit. She too, as Simeon, was not disappointed, as she arrived at the temple (the Court of Women) at the precise instant the Holy One was being presented to the Lord. Once again, a faith informed solely by the Spirit, was rewarded. It is interesting to note here how the scripture records that Anna was the daughter of Phanuel, which means “face of God”, of the tribe of Asher, which means “happy”. Essentially then, Anna was blessed by the grace of God to experience the unsurpassed joy of beholding the face of God’s Anointed. This could not be said for the vast majority in Israel, religious, zealous or otherwise. Truly, our God always preserves for Himself a remnant (Romans 9:27). Dear brethren, as I meditated on this passage of scripture, so rich and beautiful in its portrayal of these two devout and steadfast saints, I asked the Lord if there was yet more to its meaning. Was there a message or exhortation for our day perhaps? For myself personally perhaps? In so many ways, the day in which we live is profoundly similar to that of Simeon and Anna, in that the Lord may return at any moment now. Just as with them, the singular and defining quality of our lives rests in the hope of His imminent appearing as our Savior and King. What we must learn from the testimony of these two patient and spirit-led prophets is the imperative for patient endurance and faithfulness in all that He asks of us until He comes. The time is at hand and everything else is secondary. He is coming and there is a prophetic urgency for this generation as never before. Nothing else matters. Not politics. Not the economy. Not our career in this world. Not the unraveling state of the nation and the world. Not our retirement portfolio, Not the amusements and distractions of modern life. Not our big plastic house in the cardboard suburbs. Not the desperate and lukewarm condition of the church. No not even, in a relative sense, our own family concerns. Ultimately, at the end of the day, all that matters for the child of the Kingdom is that our spiritual vision is clearly set and that we are looking towards the King and His Kingdom. “The eye is the lamp of the body; so then if your eye is clear, your whole body will be full of light. “But if your eye is bad, your whole body will be full of darkness. If then the light that is in you is darkness, how great is the darkness! Folks, I have to confess that it absolutely grieves me in my spirit to see the degree of active involvement of the evangelical church here in America in this present time. And by all accounts it would appear that Christians are just as much sold out to the idols of consumerism and covetousness as non-believers. Hopelessly indebted, living beyond their means, addicted to materialism and the culture of more, more, more! Bigger, bigger, bigger! How brethren, can this be when our true citizenship is in heaven? Patience! What a concept in this ‘have it all now and get it while you can’ generation. Yet our Lord requires so much more of us, those among the Bride who look longingly for the blessed coming of the Bridegroom; He who will make us complete and perfect (James 1:4, Colossians 1:28, Philippians 1:6). And in waiting patiently with unswerving devotion to what lied before them, consider both of these elderly saints who waited their entire lives (Anna was probably over 100 years old when the Spirit directed her to the temple to meet the Lord, and Simeon was at least near the natural age of death) for the coming of the Savior. Their example is recorded forever in the Lord’s Book as a testimony, not only to their rock-solid faith and endurance, but as a warning to us today! No Pharisees, Scribes or Sadducees shared such an honor. There was no established church or denomination, or notable teacher (like Gamaliel for example) in Israel directing the people to watch and be ready in that hour. This should tell us something to all those who wish to follow men or groups and not the Living Spirit, who alone can prepare us for the thief-like coming of our Savior. Both Simeon and Anna “loved his appearing” (2 Timothy 4:8), not this present world. And this caused them to devote their entire lives and attention to being found ready and available when He came, preaching in season and out of season in the temple to exhort their fellow countrymen to watch and prepare, for the Lord’s Anointed, the One greater than Moses, was coming! Now as to the times and the epochs, brethren, you have no need of anything to be written to you. For you yourselves know full well that the day of the Lord will come just like a thief in the night. While they are saying, “Peace and safety!” then destruction will come upon them suddenly like labor pains upon a woman with child, and they will not escape. But you, brethren, are not in darkness, that the day would overtake you like a thief; for you are all sons of light and sons of day. We are not of night nor of darkness; so then let us not sleep as others do, but let us be alert and sober. For those who sleep do their sleeping at night, and those who get drunk get drunk at night. Notice brethren, in particular, the helmet (protection for the head; which is vital in battle) is the “hope of salvation”. Now if you are unaware that our salvation is most wonderfully bound up in both the first and second coming of our Lord, you will begin to appreciate what Paul is stating here. Salvation is not solely something that occurred in the past, but it has a past, present and future aspect (pertaining to the spirit, soul and body) that is essential to understand. In addition, relative to our current message, consider how this hope of salvation moved both Simeon and Anna to actively prepare and seek the Coming of the Lord. Brethren, this whole question of understanding “what the will of the Lord is”, requires being actively informed and inspired by the Holy Spirit such that you are aware of God’s plans and purposes, and are suitably and spiritually prepared. It involves having eyes and ears wide open in the Spirit such that we might see and hear what He is doing and saying in this prophetic hour. Again, consider Simeon and Anna, and the fact that it was no accident or coincidence that they were in the right place at the right time, and in the right spirit. Only the Lord can accomplish this in His servants. And in Revelation 3, the Philadelphian church is enjoined to hold fast to what they had, and to overcome that no one would take their crown, for He is coming quickly! This indeed was the testimony of Simeon and Anna, as revealed to us in the Word of God. That they lived every single day in preparation and anticipation of the coming of the Lord. Their hope was not in the political or even religious rulers of their day, nor in economic independence or fleeting riches, or science or discovery or anything else. Because they “kept the word of the Lord’s patience” and persevered in watchfulness, faith and purity, their joy was fulfilled, and they alone out of perhaps many thousands in Israel were blessed to behold their King and Savior. Take heed brethren, for this is indeed a powerful exhortation being offered to us in this hour, through the faithful testimony of these “little ones” at the presentation of Jesus 2,000 years ago. “Behold, I am coming quickly, and My reward is with Me, to render to every man according to what he has done. “I am the Alpha and the Omega, the first and the last, the beginning and the end. Blessed are those who wash their robes, so that they may have the right to the tree of life, and may enter by the gates into the city. Outside are the dogs and the sorcerers and the immoral persons and the murderers and the idolaters, and everyone who loves and practices lying. “I, Jesus, have sent My angel to testify to you these things for the churches. I am the root and the descendant of David, the bright morning star. The Spirit and the bride say, “Come.” And let the one who hears say, “Come.” And let the one who is thirsty come; let the one who wishes take the water of life without cost. Both Simeon and Anna responded to the Holy Spirit, and as a result they were found ready and worthy at the Lord’s first coming to His own. They studied the Scriptures and faithfully responded to the prophetic urgency of the time in which they lived. Nothing deterred or distracted them from the singular occupation of their hearts and lives; not the noise and commotion of the Roman Empire subsuming everything around them (as the American empire is doing in our day); not the lifeless religion and mindless man-following being perpetrated in the synagogues every Sabbath, not the scoffers who must have certainly plagued them constantly in the temple. No, they loved their Lord! They believed their God! They listened to the Holy Spirit not religious experts! And they alone were ready. They alone were there to meet the Child who was the Savior of the world, and the King of Israel, and the Hope of the gentiles! Dear Father in Heaven, Lord of All Life, please help us to take this message to heart and to put away all things that lead us away from what is truly essential in this hour – being found ready and watching at the Coming of Your Son! When He comes the second time to the earth, out of heaven, He will not be a babe, nor a lamb, but the Lion of the Tribe of Judah, the King and Judge over all the heavens and the earth, He who wields the sword from out of His mouth to defeat all of His enemies and establish His righteous kingdom forever and ever. Dear brethren – those who are truly about the Lord’s Work in these final days are always leaning into Him that they would hear that still small voice of His counsel and guidance. They are acutely aware of their own utter incapacity to effect anything of “eternal kingdom consequence”. They neither desire nor seek glory for themselves or their own name, for they are wondrously and mysteriously obscured in Him – of one mind and pulse and heart, in total agreement with His mind and will. It is like our Lord, who said that when we have seen Him we have seen the Father, for they walk together in complete unity and purpose. It can only be the Lord’s Work when the worker is one with the Lord! The words they speak are not their own, nor are their plans and ambitions self-conceived. It is the Lord’s pure and perfect heart beating in them, filling them with His life and thoughts, His love and concern. Heaven and earth are their witness, and the God who made both sustains them always, keeping them steady, keeping them true. They have a burden to bear, yet it is the Lord’s burden, and only He can equip the worker to carry it. His word – as in the case of the prophet Jeremiah – can be a fire in the belly that demands release. To deviate by even one small step from his plan is frightening to them, and their prayers testify to this. “Keep me true to You Oh Lord” is the cry of their heart! These are His true prophets and spokesmen! These are they who are jealous for His Glory and His Name! These are few on the earth, yet only through them does the Lord work. Never before have we witnessed so much activity and ministry being conducted in the name of Jesus Christ. Never before has so many individuals and organizations existed who are ostensibly about the Lord’s business. Never before have so many self-annointed prophets and seers appeared on the scene delivering words and visions for the people of God. And yet sadly my brethren, never before has so little been done in the power and efficacy of the Holy Spirit. Those with spiritual eyes know this to be true, and pray it would be otherwise. Yet the Lord Himself will test all work conducted in His Name, and all those who profess to do it. Nothing is hidden from His sight, and all will be revealed at the appointed time. Lest I be tempted to resort to men’s ways, to the world’s methods, or to Satan’s tricks – I will pray ‘Thy will be done”, and labor in faith, that He alone should claim His Glory! Lest I strive from any other purpose, other than a love for Him and His begotten, I will keep watch over my heart, and pray for motives pure and truth sent from heaven. Lest I forget He who shares His plans, who defers to us His thoughts, who makes a path where there be none – I will advance behind His footprints alone. He alone is the Cloud and Fire that guides my way and working! Lest I place my trust and hope in men, in systems and stratagems, rather than our great Executor – I will commit myself to prayer unceasing; I will remember all who are dust and He who is Mountain. Lest my labor be by sight, by evidences seen, I will leap upon the emptiness of promise, I will step trustingly into the nothing and the silence, I will acknowledge Him as my only Reality. Lest I grow weary and despair, losing the passion of a burning heart – I will remember with tears the lost and the blind, they who are bound, empty and alone, not knowing the way and the Lord. Lest presumption consumes me as a youth, and I become proud, independent, haughty – I will surrender to the harness of His yoke, to His field and His harvest. Lest I long too much for the world around, and all its treasures, I will envision one shining, spectacular pearl sparkling in my hand – the glorious kingdom of heaven. I will await He who is my King! Lest I become so easily bloated by success, and too readily delighted by quick results – I will consider He who is the Source and the Plenty, He from which I draw every breath and claim every victory. Lest I be broken by defeat, by setbacks and plodding returns – I will thank my God alone for His perfect patience and wisdom… for He is far too kind to be cruel, far too wise to stumble, and far too deep to be fathomed. “How beautiful upon the mountains are the feet of him who brings good news, who proclaims peace, who brings glad tidings of good things, who proclaims salvation, who says to them – Your God Reigns”. Today, by His most gracious wisdom, I will be about the Lord’s Work – that all fruitfulness and glory would be His to claim, and that all His saints might praise Him, and love Him and forever seek His face! Whereas they ate and drank with Jesus of Nazareth in daily personal contact here on earth, Paul’s revelation and consideration of Him was as one seated at the right hand of God “in the heavenly places, far above all principality and power and might and dominion, and every name that is named, not only in this age but also in that which is to come” (Ephesians 1:19-20). For Paul, to truly see and affirm Jesus Christ, was to behold the “all in all” for whom and through whom all things in the past, present and future must come to fulfillment and fruition. What the original disciples were permitted by the Spirit to glimpse on the mount of transfiguration, and what John beheld on the Island of Patmos (in Revelation), Paul was afforded the language and ‘theology’ to express. For Him, everything exists – without exception – such that the Heavenly Father might honor and bless his beloved Son; that He might exalt Him above all else that would be exalted. Through the New Testament we discover that it is primarily through the ministry and testimony of Paul that Jesus is revealed and presented as God. My brethren, there is a vast and immeasurable difference between a man that does god-like things and one who is in fact God. Many of the prophets of the Old Testament – such as Moses and Elijah performed god-like acts, controlling nature and the manipulating the material world in one sense or another. In fact, until His resurrection, nothing that Jesus did in terms of miracles outmatched anything seen before. Elijah revived the widow’s son as surely as Jesus raised Lazarus, and Elisha multiplied the pot of stew as readily as our Lord multiplied the loaves and fishes. Indeed there is much evidence that the disciples struggled mightily with this question of whether the one they were following was merely a man doing god-like things or very God Himself. “Who are you?” – was not just something the religious leaders of the day wrestled with, but also Peter and James and John and all of those in His immediate company. Was He a prophet? Indeed was He “the prophet”, the one spoken of by Moses? Or something more? The Lord Himself relieved them of this burden when He declared, in no uncertain terms, that He was in fact the Son of God. In declaring this, He was clearly and unmistakably asserting His divinity, His godhood. Recall that many walked away from Him over this very issue. And indeed, this is still the only issue that truly matters for any of us – who we believe that He is? For Paul, from the moment the Lord met him on that Damascus Road, the issue was settled. Interestingly enough, he was blinded to all material reality for a time, that he might come to see the One whom he persecuted elevated in ultimate glory at the right hand of the Father in heaven. This is where He resides today my friends. Yes, He obviously came and experienced life as a human being on this earth, but it is important now to recognize and consider Him as God, above all things, shining in ultimate glory. Is this then how we consider and relate to Him? Like Paul, is He the “all in all” in our own lives and experience? Is our admiration and adoration of Him, essentially limited to Jesus the man; or do we see Him raised up, drawing all things unto Himself as only God can do? Which Jesus do we find most compelling – a saintly man with god-like abilities, a sagacious teacher perhaps, or the very Son of God for whom all creation was intended? The Apostle Paul sees a pre-eminently heavenly Jesus, in all of His former and even His more endowed glory (by virtue of the incarnation, cross and resurrection as the firstborn of men into the household of God). Although they are one and the same, there is night and day between the carpenter Jesus who walked this earth and the Jesus portrayed throughout the Book of Hebrews and Revelation. Now I know that there is some debate on this, but I personally have no trouble believing that these words are the words of Paul, for in style and substance they reflect his message perfectly – Jesus as the heavenly fulfillment of all things. He continues in verse 5, and as you read along, notice how everything bows and falls before the ultimate fulfillment found in the Son: the ministry of angels and patriarchs and priests, even human prophets – all swallowed up and eclipsed by He who Paul calls the “all in all”. Now many scholars will admit than the English language is not very precise when it comes to expressing ultimacy or quintessence. Yet in the “all in all” we come as close as we can to that which is the “most”. Jesus, in the end, is the very most that the Father had to give. He is the author and finisher of our salvation, the beginning and the end, the supreme One in whom all life and reality and purpose converges and turns. 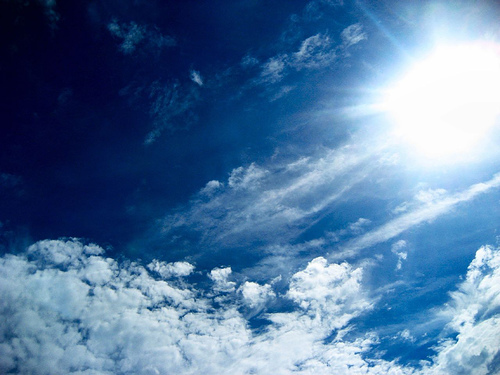 It is His glory which shines brighter than any other, for He too is God. His face is the face of God. His hands extend the touch of God upon our lives. His love shares the very heart of God. His light represents the wisdom and truth that is God. His very words uphold and sustain life as only God can. Every living cell in this universe pulses with vitality because He ordains and sustains it. Without and apart from Him, there would be no created reality as we know it, for He made it and holds it all together. There is no other way around it, my friends – the Christ whom we serve and love and worship – He is God! And if there be any call on this Christian path – be it an evangelical call, a prophetic call, or a call to repentance and sanctification – then truly it can only flow from the inescapable reality of the ultimate divinity of the Lord Jesus Christ! Now we can certainly acknowledge, without reducing anything we have said above, that it can be useful to consider the humanity of Jesus, for indeed He was “all man” as well as being “all god”. Yet the recorded example of the perfect man does no more to help us in practical terms than the Book of Proverbs help us to be wise. What really counts is the power to attain, the life within – and even our Lord told His followers that it was better that He went away (to return to His pre-incarnate glory), for only then would His presence and power be unlimited and unconstrained by His humanity. Certainly there was an earthly Jesus, but consider also how frequently the Apostle Paul uses the terms heaven and heavenly throughout his writings. Clearly here is where he thinks our emphasis and attention should be. It is here in the heavenlies where the Father is reconciling all things to Himself, in and through His Son. Here is the final stage, where the final acts of creation’s history are played out in the Book of Revelation. Here is the true home of the church, and the hope of all who would follow the Firstborn into the Household of God. Dear brethren, can we ever emphasize this too strongly? Whereas so many secondary things (doctrines, methods, programs, themes, etc.) grow old and worn, can we ever be reminded too much of what our Lord truly is and represents as the Beginning and End, in the eternal present of God? So many other things, lesser things, seem to be so important today, when He is really all that matters, and has ever mattered. Why haven’t we learned the lesson of so many generations and movements that every vain attempt to add to the “ALL” that He represents can only lead to idolatry and delusion? Why does He never seem to be enough for some folks, when He is more than enough for the Father? In Ezekiel 34, we see the Lord’s brutal indictment against the shepherds in the land who were not fulfilling their charge by adequately feeding, tending for, and protecting the sheep. Rather, they were devouring them and getting fat off of them. Dear saints, does this look at all familiar to any of you as you look out on the Christian landscape? Astounding! Did you see that? The Lord will not replace the shepherds with others (hired hands) but He Himself will personally become their Shepherd. He will directly assume responsibility for feeding and protecting (the two primary tasks of a shepherd) the sheep. My friends, please hear in the spirit what this speaks to us – the Lord alone is our Shepherd. Never again will men assume this role. The Lord God, in the eternal and heavenly counsel of His wisdom, has determined this. Jesus Christ is charged with feeding, protecting (and even ultimately judging) the Father’s flock. He alone has been deemed worthy. This is the command and the authority He has received from His Father. Ah, so there are elders who are tasked with shepherding God’s flock, but this is not an official or titular role. They are not “the Shepherd”, but rather workers in the field, with shepherding duties. (In actuality, they too are sheep). It has already been made clear that no longer will “hired hands” ever assume primary care over God’s sheep. It is the Chief Shepherd that exercises primary care over the sheep. The Lord Jesus Himself used this language frequently during His time on earth, to convey His loving concern for the sheep who were routinely left to the ravages of predators. Brethren, our spiritual sustenance and survival are contingent upon no man, not even ourselves. Let us look to the Good Shepherd of Our Souls, in living and abandoned faith, to provide every good thing in Christ. He knows His sheep perfectly doesn’t He? And He loves them perfectly. While we may learn from one another, as His life and truth flow out from one vessel to the next; while we can indeed edify and encourage one another in the faith, setting a pure example among the saints (as Peter indicates), these are such small things compared to what the Good Shepherd must represent to us intimately and exclusively. We are all merely sheep, aren’t we, whether we are mature saints or newly born. Have you ever seen sheep following a lead sheep, who seems to know the location of good pasture and water? Have you ever observed a really tough bodyguard-like sheep defending the flock from a pack of hungry wolves? Now I don’t pretend to know a great deal about sheep, and there may be exceptions, but I think you see my point here. The sheep are essentially helpless without a Good Shepherd! And the Lord is our Shepherd! Hallelujah! The Lord Jesus Christ is our Shepherd! In Him we shall want for nothing. In Him alone we have peace and rest and comfort. For He is our provision and protection, and He will never abandon us for forsake us for His own self interest. We don’t need to follow or trust any mortal man anymore. Only He who is the Son of Man! We will never need to entrust our spiritual lives to any hired hand, only He who is our Eternal and Loving Shepherd. The lesson is clear, my friends. Two-thousand years of sordid church history marks this testimony to be true. Oh, how so many false shepherds have scattered and devoured so many little ones, when they should have rightly protected and nurtured them. Rather than lead them to the House of the Lord, they led them into the barren wilderness, estranged and alienated from God. Praise God that we have that Good Shepherd who will never leave us nor forsake us! Praise God indeed! Father, oh Father, what riches and wonders we discover in Your Beloved Son, the True Shepherd who will bring us to pasture in Your eternal kingdom; who protects us faithfully and vigorously from perils without and within; who feeds us with the heavenly bread of His very life and life-giving streams of living water! Forgive us Father, for seeking shepherds other than the Good Shepherd; hired hands who care only for themselves and not for Your little ones. Oh that we would hear and know His voice as He calls to us here in the field of this world, to draw us near unto Himself, and to all His care and provision. This we pray as it is Your will, in His name. Amen. Dear friends, these past few weeks have been simply agonizing for me, full of confusion, turmoil, anguish, sleeplessness, blindness, bewilderment and questioning. I have come face to face with the world in its rawest form and its bitter hatred of those who belong to the Lord Jesus Christ. Yet our Heavenly Father, in His illimitable wisdom and love, has deemed me worthy of such suffering and persecution. It seems the self in me has a long way to go before it will willingly lay down and die as it ought; indeed, as it must so that He might rise up out of the ashes of this fallen flesh. So much easier it is to read about turning the other cheek and deferring to His will than actually doing it when confronted with malicious betrayal and the very depths of hell seem to be rising up against us. At times like these, as I am sure many of you understand, we find ourselves stumbling in the dark, trying to comprehend what is happening; why events don’t make any sense. We can’t seem to turn our minds off, to stop it from spinning and replaying the same things over and over again. We are powerless, and nothing we do appears to offer comfort or resolution. We are so utterly disoriented that it begins to be clear what the Scriptures mean when they refer to us as aliens and sojourners in this world. I must confess that many of my responses of late were nothing more or less than the flesh in all of its ugly and defiant pride, trying to defend and assert itself in this world, to protect myself and my reputation against the tide of lies, confusion and attack. So very sad, and I am not feeling very Christian right now. I didn’t even want to return to this journal, as I felt so very hypocritical. Like Job and Jacob, I felt like I was wrestling with God spiritually and mentally. I wasn’t at all sure why these things were happening, how He could permit them. I couldn’t pray for a couple of days, and when I did all that came out was self-pitying and self-justifying whining. Sound familiar? I couldn’t actually concentrate on anything for any length of time. I would open the Bible, but there seemed to be a thick wall inserted between me and the words. Disillusioned, disheartened, and feeling alone and rejected, it was as if I had died, that my heart had stopped. I cried out to Him for He is all I have. I have no one else. All that the Lord has been showing me over this past many months; the depths of His ways and wisdom summed up in His Beloved Son. All these high-minded prayers about going further and deeper and letting it all go. All became fuzzy and twisted as the gentle hand of His comforting Spirit seemed to be lifted from my life. Although I kept crying out to Him for understanding and meaning (why Lord, why Lord), this was not really what I needed at all, and He knew that perfectly as only He can. At that very moment where I couldn’t possibly endure another second, His voice broke through from Heaven, deep into my very being. It was like an anvil had been lifted from my chest. Dear friends, my heart was troubled and I was very much afraid. I thought I was going out of my mind. Nothing made any sense, as I mentioned. So what does He mean by this assurance of peace? Here we see that His peace is not the absence of tribulation or conflict, as this is what the world means by peace. The world is always talking about and pining for peace, but the history of the world and the shattered condition of the human spirit reveal how utterly empty and powerless such sentiment has become. To the world, peace infers the absence of conflict, enmity, distress, animosity; the free and easy life in other words. Yet our Lord’s peace is something altogether different, as I am slowly and painfully discovering. He has pretty much guaranteed, has He not, that in the world, we will have trouble, tribulation and conflict (the absence of peace as the world would see it)? The world hates Him, and so it only follows that it will hate us also? The destroyer is constantly seeking our destruction and will stop at nothing to achieve it. The spirit of anti-christ that pervades all the world and those aligned to it is enmity to the Spirit of God and His Christ. Yet our Lord’s desire is not that we would be removed from the world, either physically or by a conflict-free existence, but rather kept in His peace here in the middle of it. Here in the world is our proving ground; the place we need Him and His peace the most. We are to remain present in this world, and in many respects subject to it, as a stunning and vital testimony to Jesus Christ and His Kingdom. Our Lord’s promised peace is quite different from the worlds isn’t it? Although we would certainly appreciate it sometimes, it does not involve in any manner the absence of antagonism and tribulation, but the assurance of His presence in the midst of it, banishing worry and anxiety even though people and situations provoke them. In fact, it is often the case that He would have us venture forth into circumstances that will place us at risk, provoke conflict with the world, and leave us with only Him (and His strength, peace and comfort) to fall back on. “He who is in us is greater than he who is in the world.” – Indeed, and the world will discover this whether it wants to or not. And how does His peace come to us? Those who have spent anytime at all here, know that the Father does not grant anything good to His children apart from Jesus Christ. He alone is the essence of all simplicity and fulfillment. Every heavenly provision is embodied and made available in Him. The granting of His peace is no exception. John 16:33 reminds us that “in Me you have peace”, meaning that peace is not some emotional attribute or quality of mind that He provides apart from Himself. His peace is made possible only by Him abiding in our hearts, as we abide in this world. He alone is our peace, here in the midst of pressure, persecution and the spirit of enmity that pervades the world. The Lord’s promise of the Comforter was the promise of His Holy Spirit. Peace, as with any other divine attribute is synonymous with the Lord Jesus Christ. He is the true vine from which all heavenly fruit flows. He alone is our “peace, quietness, rest, and unity” as is embodied in the Greek word for peace – “eirenē”. He has promised to guard our hearts and minds “through Christ Jesus” – to be our ever-present peace and provision in the midst of the world and the devil’s animosity and murderous intent. As such, we are not to in any way allow people or circumstances to separate us from our God, who promises to fortify us in the center of the storm. Rest assured brethren, that if you are a true ‘remnant child’ of the Most High, you can expect to be misunderstood, maligned, falsely accused, targeted, antagonized, persecuted, ostracized, isolated, confounded, and even betrayed by those whom you believed to be your friends or supporters. On a human or rational level, nothing will seem to make sense. Your mind will go crazy trying to seek answers to it all. You may wonder what you did to deserve this kind of treatment. You may even be tempted to do everything in your power to “make it right”. Yet, the world’s kind of peace involves compromise, conformity and agreement, and in this sense we can never be at peace with this world. Peace at any cost such as this is not applicable to citizens of the heavenly kingdom. And our Lord will undoubtedly use such hard conditions and testing to bring us to the point where we love and trust Him above anything or anyone else. His way more often than not leads directly through conflict and separation. It forces a collision with the very heart of darkness and the spirit that is behind it all. Light and darkness cannot coexist peacefully, nor can life and death. There is no middle ground, nor can there be. Just as righteous Abel and all the holy prophets leading up to an including our Lord, we represent a dangerous threat to all principalities and powers that have dominion over this world. Attempting to make peace with the world is a fool’s game for the Christian. No, it is not the world’s peace we need, but the peace summed up and personified in the Prince of Peace. He is the true reality for which everything else is artificial and unreal. He is the Shining One who penetrates the lies and thick darkness of this evil world, and shines as a piercing light on all that is dead and dying. If you have ever gone out at night with a flashlight and lifted up a decaying log you will kind of get the idea. All manner of crawling things will scatter from the presence of the light. The world would have us compromise and get along. To do all we could to mitigate conflict and foster agreement. Dear saints, this is no peace at all, but a satanic ploy designed to swell the ranks of hell. To live in opposition to the world, animated by the life of Jesus Christ, is to invite enmity and opposition. The Father knew this when He sent down His Beloved and Perfect Son, and He confirms it still as He sanctifies us here in the midst of it. Yet we are not alone, for our Lord is ever present to settle and secure us, to comfort us and guard our hearts and minds from the impact of being at times despised and rejected. I am still very much trying to make sense of this, and falling into the wisdom of His ways and purposes for us here. More often lately I stumble and fall. Clearly, I have so much more to learn, as all of my carnal instincts attempt to get me to worry, to fight back, to defend myself, to try to “fix” the situation, to apply human insight or wisdom. Please believe me when I say that I am not posting this as from someone who is far along in the understanding of it. These truths are still being very much fleshed out in my life, as so many situations have arisen lately to shatter everything I have relied on to secure myself in this world. He must loosen my grip from every manner of coping and surviving in this world that do not center on His Son abiding in and strengthening my spirit. The Father assured my recently that it was His will that all of this madness enveloped me; that He actually permitted it. Not to hurt me, or see me squirm (and believe me I have been doing a lot of this), but to help me to appreciate how His provision of Peace in His Son is all that I need. Not a worry-free existence, nor a hassle-free life. Not a day without conflict and opposition – just His Son who is all the peace I will very need. I tried in vain for many days to affect the peace of the world, to make things right. Oh how I exhausted myself trying to achieve this; how I rethought every possible course of action – but no, this was not the way at all. “Not as the world gives do I give to you” said our Shepherd. Friends and brethren – the last days are upon us, and I sincerely believe with all of my heart that the hard and deep things we are learning as His children, will equip us for what is coming, and for what will be required of us. We must die to this world and its ways, and any part of us still cleaving to it must be loosed. This is most often bitter and painful, as death can only be. But our Lord must separate us to Himself, and bind us to His provision. We must come to see that we can only be contained and sustained in Him alone. Eternity awaits, with joy unimaginable, but before that there is an altar and a cross to bear; there is death and the laying down always before the rising up. Oh, how I wish it were not so, that there was another way, but not so my friends. Our Lord has called us to follow Him, yet He has left us here in the world; a world that is becoming increasingly the expression of the spirit of anti-christ. He prayed to the Father that we would be kept from the evil one. Well, the keeping is in Him alone, as He has promised to guard our hearts from failing; to secure and strengthen our resolve in His faith and truth; to comfort and settle us when storms and conflict rage all around. This, dear brethren is His peace, and by His grace will be sustained in it to the bitter end. O’ Mighty Father – how we at times hurt so bad, rejected by men, and surrounded all around by enemies. Yet our Lord too, was despised and rejected, spit upon, and hung on a cross. Oh how the madness and brutality of the world seems too much at times; how our hearts so quickly fail and we want to run, or fight back, or be tempted to make peace with the world. Keep us from such responses dear Father. Keep us in Your Beloved Son, in His Peace, by the comfort of Your Holy Spirit. Keep us O’ Lord in the name of Jesus Christ our Hope. Amen. The religious urge is immensely powerful in man, and the devil knows it. He is masterful at using humanly-derived religion to keep us from the presence of the Living God. With subtlety and craft, he secretly sets about his work of replacing true things with shadows, divine things with earthly shells, and an intimate fellowship with what amounts to an institutional bureaucracy. From where I stand, my friends, this is largely what this thing called Christianity has become, and I am not at all limiting this reference to Romanism either. It seems everywhere you turn, more and more believers are adopting practices and opinions that indicate that they love their religion more than they love the Living God. My friends, this saddens me tremendously. For it is this very religion, and all of its machinery, that is blinding us to our need for an intimate and life-filling encounter with a redeeming God. Religion, by its very nature, puts its trust in man, and not God, so it is, in essence, the perfect realization of the humanistic trend sweeping the world and the church. Yet, it is insidious because it is, at its core, POWERLESS! No mere religion can turn a devil into a disciple, or a rebel into a beloved son. No empty orthodoxy can turn a sinner into a saint, or hope in any way, shape or form to rescue the sin-ravaged soul of man, and restore him to his place in the garden. Jesus Christ, alone can do this! Why then do we persist in undermining and sidelining His redemptive and restorative work on the cross at every turn. Why are we believers so readily titillated by the latest trick, trend or technique that seeks to supplement or replace the divinely ordained process of sanctification? Why is the Helper and Comforter, Teacher and Shepherd, the One who came down from heaven to dwell among us, and die for us, seemingly never enough? Did not the Jew’s religion blind them to the love of God as revealed in their Messiah? Consider the harshness of our Lord’s language as He condemned them in the most extreme terms for obscuring the true God with their rites and practices. If we called any individual or group a “brood of vipers” or “serpents” today we would be promptly condemned as divisive and critical. Yet, it was their religion, you see, and ours today, that establishes the framework for exalting men in the place of the Most High. All of their religion had taught them nothing about God; that He in fact loved them dearly, and standing right before them, with His arms stretched out, ready to embrace them, was proof of that love. Our Lord, when he left this earth, did not leave us with any system or methodology, or “religion” – He left us with the Holy Spirit that enables and empowers us from within to relate to Himself and the Father on a deeply intimate level. He did not leave us with a song book or memory verse but newness of life! Indeed, He alone was the way home to the Father. He was the truth about God and man and how the two could be reconciled, once and for all! It is most interesting that James in the New Testament defines “pure and undefiled religion” as loving service, and not faithful adherence to creeds and tradition, or the smells and bells of church buildings, or any vain form of liturgical reality. It is the love of Christ and the Father spilling out into the streets, and into our homes, and into the broken lives of the most vulnerable among us. The Bible is clear here, my friends, so please don’t consider me “too harsh” in this assessment. Religion, by its very nature constrains, binds, obligates and obscures divine reality. It distances one from the ultimate object of worship. It esteems external observance and conformity over what is really at the heart of a man. Despite its bold claims, it directs our faith away from God, and towards created things, especially human beings and the objects of their adornment. It defies the mystery of godliness and the abandoned life at the heart of Paul’s gospel. It fosters a righteousness that cannot adequately withstand the rigors of life, the temptations of the flesh and world, nor the assaults of the adversary. It is loud and brash, and promises so much, yet delivers so little. By necessity, it must borrow from the world, because it holds no innate power or creativity of its own. It knows nothing of the living context of restored fellowship offered by Our Savior. It is deaf and dumb before the Living Word, accompanied by the Author Himself, as He fulfills its meaning by fleshing it out in our daily lives. Religion may inspire you; in this there is no doubt. It may sweep you away in a chorus of praise and sentiment. It may appeal to a part of you that wants to be appealed to. It is happy to meet your consumer needs and desires, and to satisfy the senses. It may make it look like you are venturing forth into the holiest of all, with fine linen and brass and glimmering light. But, my friends, it will never, ever change you, or save you from this body of death. It CANNOT! Only the Shepherd of your soul can do that.